В далёкой Аргентине есть газета Clarín («рожок») — самая читаемая в стране, и при этом вроде бы не совсем таблоид. Ещё там есть la presidenta Кристина Кирчнер (очень неожиданно выглядящая для своих шестидесяти с лишним лет, взгляните если не видели), и у президенты с Clarín и ещё одной главной газетой, La Nacion, уже много лет как конфликт, обе газеты в оппозиции. Также в далёкой Аргентине имеется сурковская пропаганда, которая работает на президенту. В этот раз пропаганда сделала фальшивый номер Clarín с датой за следующий, 2015 год, а точнее — за день после выборов, с заголовком «президент такой-то заплатит стервятникам всё» — имея в виду те самые хедж-фонды, которым Кристина платить по государственным долгам не хочет, отчего страна под дефолтом. Настоящий Clarín плюётся ядом в ответ — в крайне литературных выражениях (ппц, я разве что предлоги в словаре не смотрел), сравнивает Кристину с Гитлером Сталиным Пероном и описывает её к себе отношение как «навязчивое восхищение, похожее на неразделённую любовь». Вот что я узнал сегодня в рамках еженедельной проверки «а не выучил ли я испанский». Нет, не выучил. Я переводил в Immersion в Duolingo (зафрендить меня можно здесь), поэтому английский, а не русский. Да, у меня кошмарный английский. Особенно когда перевожу. Особенно когда не вполне понимаю оригинал, с которого перевожу. It was almost a student prank, although with a huge cost for the public funds, in the times when the reserves are falling, the recession is moving forward and the rising pressure of dollar seems unstoppable. The science is not certain about the existance of Yrigoyen’s newspaper. Although, we do know that Peron in 1951 commanded his own inkpot (The National Congress) to expopriate the newspaper La Prensa, to steal its prestige, format and logo and to inoculate it with his own ideology, which the real owners of that newspaper hated, given to the GCL. Cristina Kirchner also has newspapers of her own, in the hands of her friends in business, those who mantain themselves by publishing materials, which are generously providided them by the government. But in every discussion she keeps obsessing by other newspapers, which do not belong to her, to which she denies any official publications and which are, precisely, the newspapers which people choose to read. Now, instead of El Argentino, the free ultra-officialist newspaper, which is edited by Sergio Szpolski (the businessman who gets most of his money from the state for mantaining its growing media) the people in the subway or in the downtown streets were surprised with a most embarassing 8-page fake edition of the newspaper, for the power of bringing the conflict to the field. 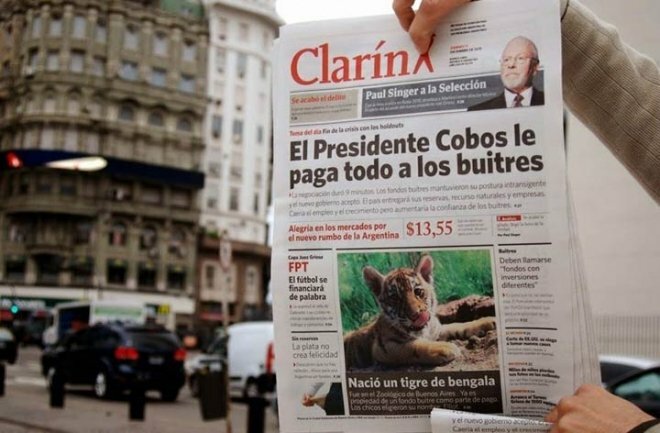 The copy of this fake Clarin has a date of December, 11th of 2015 (in other words, the next day after the end of the current second term of the current head of the state). The title on its cover says: «The President [there are three versions: Massa/Cobos/Macri] pays all to the vultures». Then, following the style and the layout of a tabloid, come the news in the same ironic manner. 1) It is confirmed, one more time, that kircherism admires Clarin obsessively. It’s a feeling akin to an unanswered love: it’s contradictory, demanding, paranoid, pursuing, suppliant and violent. It is confirmed that it’s the strategy of kirchnerism, which was prominent during the first term — retreat, but counter-attack later — the same one that made Menem and Duhalde in 1999. Remember the 2003, when Menem gained the first turn for Kirchner. И здесь попалось предложение, слова которого в смысл не складывались вообще никак. Но оно было не ключевое. 3) It is confirmed that the only things this government does plan are red herrings. While the economy is on the brink of disaster, the focus is always put on the flashy scenes, which distract from the real problems. 4) It is confirmed that the government uses the taxpayers’ money with no shame or limits to keep pushing forward their personal cruzades against the enemies in turn. Во времена былые часто читал украинские новости — движухи много, а меня не касалось совершенно: чья бы ни взяла и чем бы дело ни кончилось — сильно не расстроишься. Ну живут и живут люди. Теперь не читаю ни украинские, ни наши; а за бурной, но меня не касающейся движухой теперь разве что в Аргентинский интернет, да.